Confined Space Attendant and Fall Protection | D2000 Safety for upcoming classes. Given that it's a question asked in a safety class many students will automatically answer, yes, which is fine. But then the question becomes, "have you ever seen a confined space attendant tied off next to manhole?" The answer to that is generally "no" which begs the question, "Why not?" So how can we answer this question which seems to lie at the confluence of several different standards? I guess we need to take it piece by piece. Remain at (or very near) the entrance. Monitor the behavior of entrants (which implies the attendant can watch them as they move around the space). Possibly conduct air monitoring which also may require the attendant to have some mobility. Any fall protection measures can not impede fulfillment of these responsibilities. Attendant's Awareness: By and large, people rarely fall into holes that they are staring at. Instead, people are much more likely to fall into holes when their attention is split between the hole and their job activities. 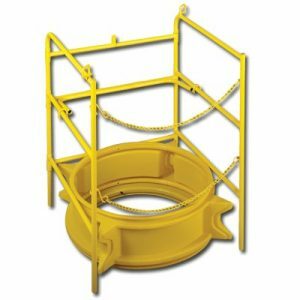 Given that the confined space attendant shouldn't have any other distracting duties, the likelihood they will fall into the hole is remote but cannot be ruled out entirely. Figure 2: Temporary guardrails for an opened manhole. 1910.23(a)(6) Every manhole floor opening shall be guarded by a standard manhole cover which need not be hinged in place. 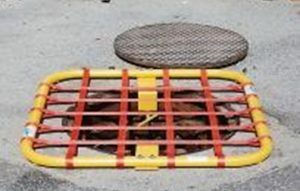 While the cover is not in place, the manhole opening shall be constantly attended by someone or shall be protected by removable standard railings. The words, "constantly attended by someone" imply that there's an attendant of some sort. And unlike other standards the rules do not require the attendant to be protected from falling using conventional fall protection systems as it does in other parts of the standards. Other parts of the standard allow the use of temporary covers as seen in Figure 2. Duty to Provide Fall Protection: If the employer believes that work activities expose workers to fall hazards then the employer is obligated to protect that worker and manage the hazard. This should be done by applying the hierarchy of controls. Given that the attendant must be right at the edge of the opening, the employer may elect to use passive fall protection which would be a guardrail of some kind. But this too may not be feasible for a variety of reasons. There are covers which may work (see Figure 3) depending on the type of work being performed. If that isn't feasible consider fall restraint systems, but finding a suitable anchor may be an issue as well as the fact that a fall restraint system may not allow the confined space attendant to access all sides of the opening. Fall arrest poses the same anchoring difficulties and the case can be made that a worker in a fall arrest system may be prone to a higher degree of carelessness around the hole given the belief that they are protected from falling. So you are then left with administrative controls which is essentially telling the worker to be careful and don't fall in. Figure 3: Temporary manhole cover. Doesn't create additional hazards (i.e., trips and slips) for the attendant. A careful evaluation of all these factors will hopefully allow us to arrive at the optimal solution and the solution will probably vary based on the job characteristics.